A special congregation was held yesterday at the University of Mines and Technology (UMaT) to install former President John Agyekum Kufuor as the first Chancellor of the university at Tarkwa in the Western Region, effect 1st November, 2017. The installation makes President Kufuor head of the university, who will preside at the ceremonies of the institution and confer on qualified persons all degrees, diplomas and certificates awarded by the university. The university council, acting on the recommendation of a search committee, appointed President Kufuor to a first term of five years and to be renewed for another term of five years. It was under the watch of the former president that the institution, which used to be the Western University College of KNUST, attained the status of full-fledged university. President Nana Addo Dankwa Akufo-Addo, who swore in former President Kufuor into his new office, praised UMaT for honouring the former head of state who inaugurated the university in August 2005. 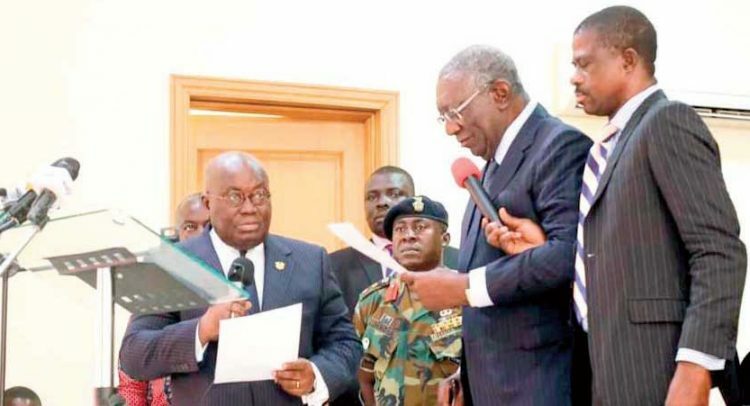 He noted that it was a well deserved honour that former President Kufuor was connected to the institution because of the core competency areas it had earmarked for itself – Mines and Technology. President Akufo-Addo indicated that UMaT continued to demonstrate and validate its promising hallmark as a well known institution in mining, petroleum, technology and allied engineering disciplines. “You need to assist government with appropriate technologies and know-how, as well as recommendations that will permanently arrest this menacing challenge to our country,” he challenged. He indicated that the prudent and efficient management of the mining sector is very critical to the sustainable development of the economy. President Akufo-Addo promised that the government would give the university GH¢5 million annually for its infrastructural development. In an address, Mr Kufuor noted that mining, which is a major component of the extractive industry, had been a key contributor to the Gross Domestic Product (GDP) of countries endowed with the natural resources. He said that UMaT, having chosen to be committed singularly to the important academic endeavour, with accompanying practical experience, is worthy of government’s support. “I envisage a future where this university will fast become the centre of the industry-driven transformational economic takeoff and the cornerstone of government’s development policies,” Mr Kufuor added. He urged UMaT not to sit unconcerned as the government seeks a permanent solution to the galamsey (illegal mining) menace that has devastated the environment and destroyed many water bodies. According to former President Kufuor, the university’s strategic position in the West African sub-region calls for government’s attention for expansion to continue to provide its mandate of teaching, research and community service, not only in Ghana, but also in the sub-region. “There is therefore the need to establish legacy projects that would serve as growth poles, particularly for the economic development of the directly affected areas like Tarkwa, Prestea and Bogoso,” he indicated. The Vice Chancellor of UMaT, Prof Jerry Kumah, disclosed that the Marine Engineering Department of the university had designed and manufactured a direct gold smelting kit called “Sika Bukyia” used to recover gold without the use of mercury. “The kit has been tested in the field and adjudged by United Nations Environment Programme (UNEP) as one of the best technologies of the type in the world,” Prof Kumah said with elation. He noted that UMaT needed substantial funds for the construction of a 20,000 student capacity camp on a new site given to the university by the Wassa Fiase Traditional Council, along the Tarkwa-Bogoso Road.